Land value – you wait til the end of the article to identify the solution! You say … it was the arrival of the subway that transformed a seedy neighborhood called Longacre Square into Times Square, that made Coney Island an amusement park for the masses. 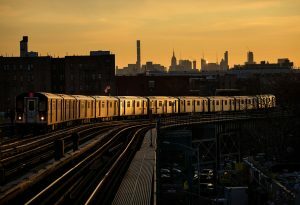 Other cities had subways, but none threaded through nearly as many neighborhoods as New York’s, enabling it to move large numbers of workers between Manhattan and the middle-class boroughs — a cycle that repeated itself every day, generating ever more wealth and drawing in ever more people … then … from 1993 to 2013, the average price for a co-op or condo in TriBeCa rose from $182 per square foot to $1,569. In the process, prime real estate in Manhattan was transformed from a place where people lived and built businesses into a high-yield investment in which absentee owners parked their money and watched it grow. But you still don’t get it. Land value is where the money is and when MTA/NYC captures it, you have the answer to how to save the subway. I know speculators run the City and don’t want to share their unearned wealth. Have you ever thought about interviewing experts in land value capture, if not in NYC (Henry George School of Social Science) but in Hong Kong or Singapore? Should we assume the NYTimes is a comic book, giving us fantasy because the real world is so hard to take?